Bitcoin price could be in for a longer-term climb as it looks ready to form another inverse head and shoulders pattern. Recall that bitcoin price staged a decent rally after forming a smaller inverse head and shoulders on its 1-hour chart. Price has yet to test the neckline around $11,000 and break higher before confirming the potential climb. Bitcoin price is in the middle of creating another inverse head and shoulders formation that could lead to more rallies. 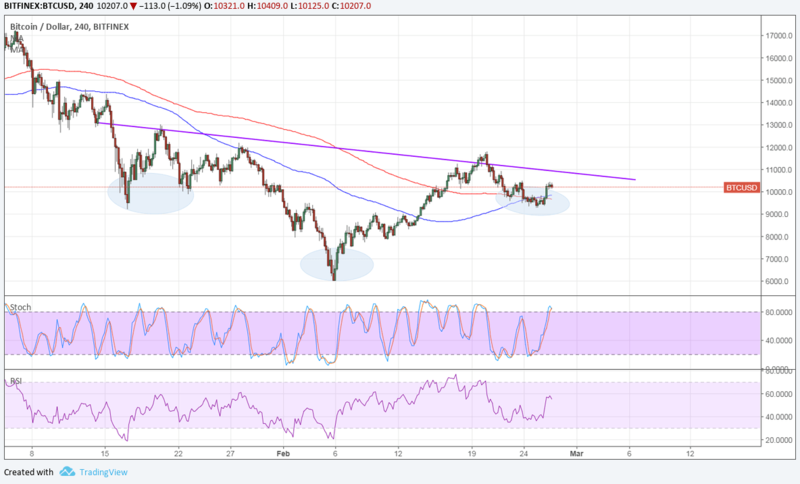 The 100 SMA is crossing above the longer-term 200 SMA on the 4-hour time frame to signal that the path of least resistance is now to the upside. This suggests that the previous downtrend is getting ready for a reversal. These moving averages are currently holding as dynamic support as well. A break past the neckline could lead to a climb of the same height as the formation or roughly $5,000. Stochastic is on the move up to indicate that buyers have the upper hand but is also dipping into overbought territory to signal bullish exhaustion. RSI has more room to climb, so buying pressure could stay in place for a bit longer. However, if the neckline keeps gains in check, bitcoin price could revisit the area of interest at $10,000 then at $9,000. Risk appetite peeked back in the financial markets during the US session as traders appeared to be bracing for more cautious remarks from new Fed Chief Powell. If so, businesses and consumers could look forward to a longer period of low interest rates or a slower pace of tightening, which would be good for stocks and commodities. However, what really boosted bitcoin price was the news that cross-border currency exchange company Circle acquired Poloniex, which is a leading crypto exchange platform. Poloniex has the seventh-largest market share of BTCUSD trading volume, according to CryptoCompare.